4 3/4" x 7 1/4" 4-page printed program for concert held at the Congregational Church in Conway, Mass. Includes "Floral Concert" paired "Together with the Flower Queen, or the Coronation of the Rose." H. D. Mirick & Co., Printers, Greenfield, Mass. 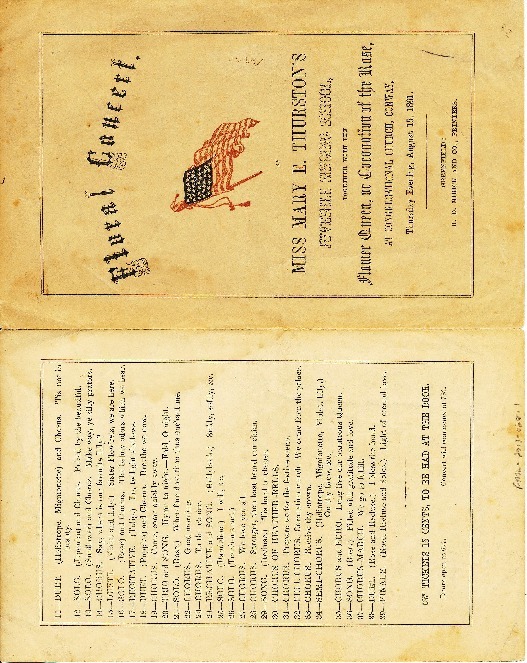 Miss Mary E. Thurston's Juvenile Singing School, “Program for Floral Concert by Miss Mary E. Thurston's Juvenile Singing School, 1861,” Conway Historical Society, accessed April 21, 2019, http://conwaymasshistory.org/items/show/951.